1. Preheat the oven to 200°C, gas mark 6. Place the Christmas pudding in a saucepan with the clementine zest and juice and brandy and warm until softened. Allow to cool, then spoon into a disposable piping bag. 2. In a small bowl mix together the signature spice with the sugar. 3. Cut the filo sheets in half. 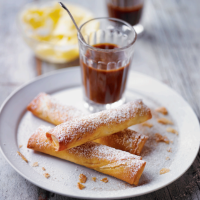 Brush each half sheet of filo pastry with butter and sprinkle with a little of the spiced sugar. Cut 1cm off the end of the piping bag, pipe an 8cm line of Christmas pudding mix into the corner of each pastry square, then roll up diagonally like a cigar, folding in the edges to encase the filling. 4. Brush with more butter and place on a baking sheet. Repeat, until all the pastry and pudding are used up. Bake in the preheated oven for 20 minutes until golden and crisp. 5. Dust with golden icing sugar and serve warm with leftover brandy butter.